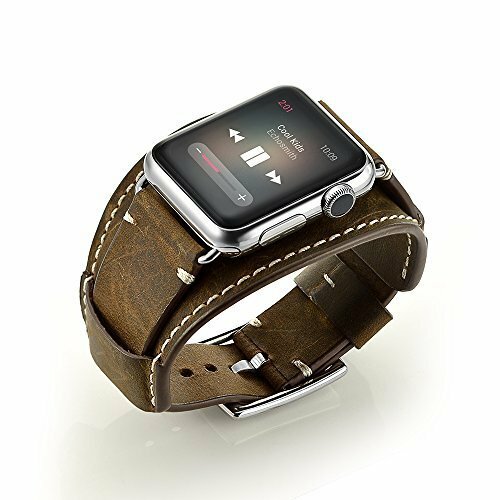 Features:The most obvious feature of crazy-horse leather is that leather items may have wrinkles, scars, scratches that are inherent characteristics and natural beauty of the hide to present the style of retro and wildness. When you scrape it widely, the trace will be appeared. If the trace is not obvious, you can wipe it gently and then the trace will be less.Besides, the color of this band will change if you wear a long time， the color will become light colors, and it will gradually bacome brown if it used for a long time. Please Note::the Apple watch in pics is not included, the product is third part product. Please take a look at your wrist before you buy it, if you need a bigger size, Please contact us, we can customize it for you. Please Note: Sell the apple watch band only, the Apple watch in pics is not included. Please take a look at your wrist before you buy it, if you need a bigger size, please contact us, we can customize it for you. If you have any questions about this product by Loveblue, contact us by completing and submitting the form below. If you are looking for a specif part number, please include it with your message.